Immigrant, Montana is a maze of memory and homeland. It’s a labyrinth of narrative and memoir—surely much of this remarkable novel is memoir—with surprising twists and turns taking the reader through history, geography, and footnotes that rival Simon Winchester not in their length but in the paths beyond where the narrative takes us. If you looked for Montana the state (as this reviewer did) inside this story, you will not find it in the first third of the book. But the first half of this intriguing title, Immigrant, is the star and this story and it’s all about the star. Pulitzer Prize-winning author Joyce Carol Oates once noted that a great story had three parts. First, the reader must feel empathy for the character. Author Amitava Kumar creates a character we do care about and cheer for. Kailash—called AK-47 by his American friends is an immigrant from India, and he’s caught between missing home and trying to find love and understanding in this new place. “What I’m learning in America,” Kailash tells us, “was new and illuminating but it became valuable only when it was linked to my past.” Kailash’s past is woven into the narrative through photos, poetry, a kind of stream of consciousness approach at times and moves into the future with a mock trial where he makes his case at various times for his mistakes—especially in his search for love. We care about him, cheer for him, and want him to succeed with his quest for love. At times, his longing for past and future to be within his present is painful—but becoming deeply connected to a protagonist’s struggle is what empathy is all about. Oates’ second feature of a great story is to give voice to voices seldom heard. Immigrant, Montana is all about voices we rarely hear from—those of immigrants. Kailash comments about one of his lovers—a Chinese student, Cai—who notes the bold assertions American’s T-shirts say about the Americans who wear them. Kailash muses about whether her observation is because she’s Chinese. He decides that no, that it is a common experience of immigrants to attend to T-shirt messages. “You come to America and just as you try to understand the road signs you also take note of T-shirts. 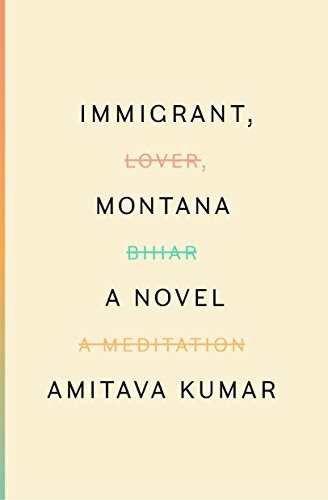 The affluent-looking middle-aged white man in Coney Island with the T-shirt shamelessly announcing MY INDIAN NAME IS RUNNING WITH BEER.” The reader is invited to see the world through the eyes of a poor student who nevertheless experiences wealth unheard of in his poverty stricken India home. For his relatives in his village, he is privileged; but Kailash and his non-American colleagues are in constant anxiety about relationships, getting food, having enough money to take the next steps on his journey in this foreign land. Finally, Oates tells us that a great story must memorialize. Immigrant Montana commemorates the experiences of those moving through the wilderness of leaving home. It also shows us the importance of a cultural broker, someone we can all look to when we enter a wilderness whether it’s marriage or getting one’s thesis approved. Former lovers now married grant Kailash a way to make sense of committed relationships as well as their peril, and his university professor Ehsaan offers wisdom for this young, complex, poetic student of English literature and life in a foreign land. In the end, Kumar tells us more about the title and its place in this story. But by then we the mystery revealed is less significant because we’ve become an immigrant ourselves finding our way in the maze of this moving, more than a coming-of-age poetic story. Jane Kirkpatrick is the author of 30 novels and nonfiction titles. Her most recent novel is All She Left Behind.